Measuring 330 meters long, 220 meters wide and 69.2 meters tall, the design of the Bird's Nest stadium design is based on 24 trussed columns, weighing 1000 tons each. Due to their weight, no crane was strong enough to lift the columns into place when construction of the stadium's steel outer shell began in 2005. As a result, the columns were shipped in parts to Beijing and assembled in position. After all 24 columns were in place, smaller beams were welded between to give the structure greater strength and enhance the unique, elliptical crosshatch appearance. Finally, the third set of beams was added in order to hang the transparent, polymer membrane, which provides roofing between the steel beams. During the design stage of the project, the Swiss architecture firm Herzog & de Meuron, along with their partners Arup and China Architecture Design & Research Group, had numerous issues to address beyond the aesthetic appeal of the stadium. One crucial problem was whether, once in place, the 42,000 tons of steel required to build the structure would be able to support its own weight, or whether it would crumble once the 78 support pillars used during construction were removed. The local government also required that the stadium design be able to withstand an 8.0 magnitude earthquake. As if these issues were not complicated enough, the architects and engineers also had to keep in mind the effects of thermal expansion, that is the tendency for steel to expand and contract as the temperature changes. In Beijing, where the temperature can range from over 30°C in the summer to -20°C in the winter, this is no small consideration. To address these three engineering issues the design team worked with Chinese steel producers Baosteel and Wuhan Iron & Steel to develop new steel grades that would meet the strength and flexibility requirements of the project. According to Lin Shuguang, General Manager of Baosteel, three months of research led to the production of a new steel with low phosphor and low sulfur content, which they termed Q35. Q35 is a high-hardness steel able to bear stress up to 35 x 106 pascals. This would be critical in the construction of the 24 trussed columns, each of which was 300 meters in length and expected to help bare a load of 11,200 tons. Wuhan Iron and Steel group designed the second grade of steel that would make up the remaining portion of the stadium's shell, referred to as Q460. Q460 provided a high strength, but flexible, steel to support the trusses and ensure that the stadium's shell would not become a 42,000-ton steel heap. The new, high strength steels, however, presented their own problems during construction, as higher than normal welding temperatures were required, often in very precarious and high locations. Welding, moreover, could only be conducted at temperatures of 15-16°C, which meant that workers had to weld during evening hours. In August of 2006, over 400 welders worked for three straight nights to weld the 320 kilometers of welding seams required to assemble the stadium's iconic, latticed steel frame. By September of 2006, the structure was deemed ready to stand on its own and the 78 support pillars were removed one-by-one in front of a nervous design and construction team, leaving the entire structure standing on its own. 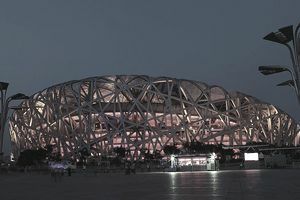 Like the Eiffel Tower, the Bird's Nest has not been without its share of criticism, particularly for its non-traditional style and appearance. Nevertheless, it has become a poignant symbol of modern China and the engineering ability of mankind. See China's Tallest Skyscraper: How High Can the Industry Go? Where Are the World's Largest Construction Projects?